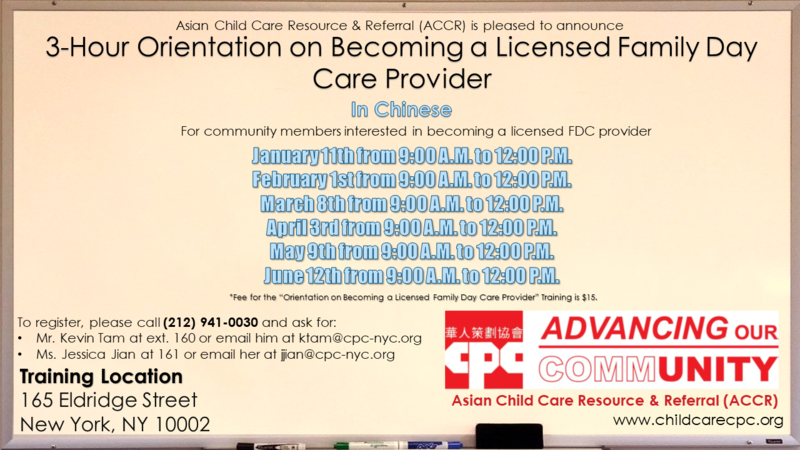 This 3-hour workshop is mainly for members of the Chinese community who are interested in becoming a licensed FDC provider. During the workshop, participants will learn about the licensing process, the different modalities of family day care, the basic health and safety requirements for the home, and trainings requirements for the prospective provider. The final hour of the workshop will be a Q&A session. January 11th from 9:00 A.M. to 12:00 P.M.
February 1st from 9:00 A.M. to 12:00 P.M.
March 8th from 9:00 A.M. to 12:00 P.M.
April 3rd from 9:00 A.M. to 12:00 P.M.
May 9th from 9:00 A.M. to 12:00 P.M.
June 12th from 9:00 A.M. to 12:00 P.M.